The math questions are on the above link. Please give me feedback on the comment. Calvin and Hobbes Cartoon 2You and Mr. Jones are both traveling towards each other. Mr. Jones is traveling at 35 mph, and you are traveling at 40 mph. In other words, every hour, the distance between you to lessens by 35 + 40 = 75 miles. You can therefore think of this problem as one car covering 50 miles while going at 75 mph. The time this will take is distance/rate, or 50/75 = 2/3 hours. 2/3 hours times 60 minutes/hour = 40 minutes. Add this to the starting time of 5:00, and you will pass Mr. Jones at 5:40. Calvin and Hobbes Cartoon 3There are actually two answers ( 10 or 10/3 ) to this problem, because there are two different ways the points can be lined up. 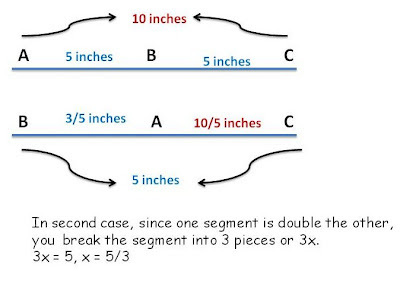 If the points are in the order A-B-C and BC = 5 inches (given) , which means AB must also be 5 inches. This way, AC will be 10 inches, which satisfies the condition that AC = 2AB. 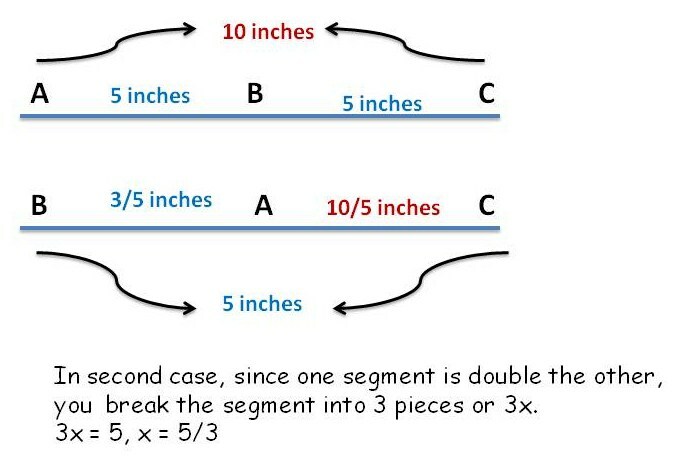 If the points are in the order B-A-C and BC = 5 inches, which means that AB + AC = 5 inches (make sure you see why – the parts of a whole add up to the whole) and, since AC = 2AB, AB = 5/3 and AC = 10/3 inches. Once again, Jack and Joe are driving towards each other. Since Jack is driving at 60 mph, and Joe is driving at 30 mph, the distance between them is decreasing by 90 mph. Therefore, the combined result is one car driving at 90 mph. Distance = rate x time, so distance = 90 mph x 10/60 hours (10 mins is 10/60 or 1/6 of an hour) The answer is 15 miles. #1: Mary drove 50 miles at an average speed of 40 miles per hour to her friend's house, and drove back home on the same route at an average speed of 60 miles per hour. What was her average speed for the entire trip, in miles per hour? #2: John traveled 60 miles an hour and Edwards traveled 45 miles an hour. Both departed at the same spot in the same direction. After 45 minutes of driving, how far were they apart? #3: A car drives in a circular path with a diameter of 800 feet. If the car completes exactly 2 laps each minute, what is the car's speed, in feet per second? Express your answer to the nearest whole number. 45 miles per hour back home, how far away is your home to the office where you work? #5: Driving to work, if your speed is 20 miles per hour, you'll be 10 minutes late; however, if your driving speed is 30 miles per hour, you'll be 10 minutes earlier. What speed will get you to work on time? #6: If you walk from your house to the school at the rate of 4 km/hour, you'll reach the school 15 minutes earlier than the scheduled time. If you walk at the rate of 3 km/hour, you'll reach the school 15 minutes late. What is the distance of the school from your house? Average speed, or rate, is equal to total distance divided by total time: R = D/T. We know the total distance: Mary drives 50 miles to her friend’s house, and 50 miles back, for a total distance of 100 miles. Combining these two results, we find that her total time is 5/4 hours + 5/6 hours, or 25/12 hours. Now we have the total distance and the total time, so her average speed for the entire trip is 100 miles / (25/12 hours), or 48 mph. Two segments of the same length (to work and back home). #2. 11.25 , very straight-forward questions, just remember that the time given is in minutes, not hours, so you need to convert minutes to hours. #3. The first step in any rate problem is to see which of the three variables – rate, distance, and time – we have. Since we’re looking for the car’s speed, or rate, that’s going to be our unknown. The question tells us that the car completes 2 laps each minute, which gives us distance and time. Notice that the problem wants the rate in feet per second, so we’ll need to do a few conversions at the end. First, to find distance, we need to convert the phrase ‘2 laps’ into units of feet. The car is on a circular path with diameter 800 feet. In other words, 1 lap is equal to the circumference of a circle with diameter 800 feet, which is equal to 800 π feet. Therefore, two laps is equal to 1600π feet. Now we’ve got total distance. We know that this distance is covered in 1 minute, or 60 seconds. Therefore, the car’s speed is equal to 1600 π feet / 60 seconds, or approximately 84 feet/second. # 4: Let D be the distance. Times 90 (LCM) on both sides. #5: Use harmonic mean [See solution II on question #1], since both time late and early is the same. You can just ignore it. The answer is 24 mpr. #6: D = RT; We can set up the equation and make the time on both sides = to you'll walk to the school on time. For the ABC question; nothing in the problem states AB=BC. It's a leap in logic, I don't think that one has an answer. But thank yiu for the other questions, I'm slightly less dumb now. Thanks for the questions...They really helped. Of course, this assumes the points are coplanar. If not, the circle becomes a sphere, etc. What a weird problem to give a six year old.